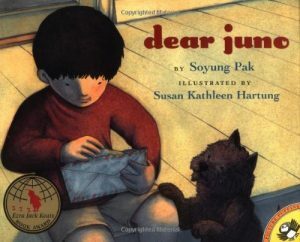 This bibliography features Korean heritage children’s and young adult literature. The intent is not to be comprehensive but rather to highlight. ARCHER’S QUEST by Linda Sue Park (Clarion, 2006). In this time travel fantasy, Chu-mong, the Great Archer of Ancient Korea, appears suddenly in Kevin’s room, after having fallen off a tiger. Kevin has no idea how it happened, but knows that he must return Chu-mong to the past or history will be irrevocably altered. This intelligent fantasy has Kevin seamlessly drawing on a wide array of knowledge as he attempts to acclimate Chu-mong to the present day and send him home. Dramatic, fun, smart, and satisfying. Ages 9-up. Recommendation by Greg Leitich Smith. Read The Story Behind The Story from Linda Sue Park. 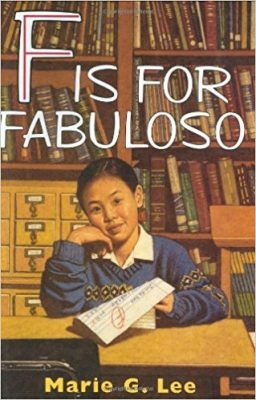 F IS FOR FABULOSO by Marie G. Lee (Avon, 1999). Jin-Ha’s teachers assume she must be performing amazing well in math class because . . . well, don’t all Asian Americans? But in this stereotype-busting story, they’re wrong. Jin-Ha is smart, but it doesn’t come naturally to her, and having a bad teacher just makes matters worse. But when she lies to her immigrant parents about the F on her test, will a bully turn friend? And will Jin-Ha ever manage to set things right? A sweet, sometimes funny novel. Ages 10-up. 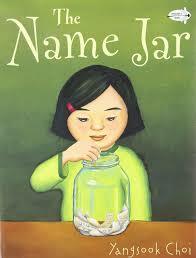 THE NAME JAR by Yangsook Choi (Alfred A. Knopf, 2001). Unhei, a young Korean immigrant contemplates changing her name to one more common in the United States. Ages 4-up. NECESSARY ROUGHNESS by Marie G. Lee (HarperCollins, 1996). Chang Jung Kim encounters racism and struggles to fit in after moving to a small town in Minnesota from Los Angeles. Ages 12-up. PEACEBOUND TRAINS by Haemi Balgassi, illustrated by Chris Soentpiet (Clarion, 1996). Sumi misses her mother, who is in the Army, but she still has Harmuny (grandmother). They sit on Sumi’s favorite rock and “at the sound of a train whistle” Harmuny recalls when she and Sumi’s mother escaped war in Seoul, Korea on the roof of a peacebound train. Ages 7-up. 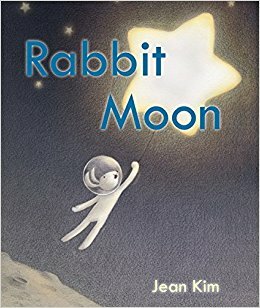 RABBIT MOON by Jean Kim (Arthur A. Levine/Scholastic 2018). The Rabbit in the Moon grants wishes that sail up to him from the Earth below. But when he gets lonely, he uses a wish to go down to the Earth himself. There, he makes friends, but as the days pass, the night sky grows darker. What is the Wish Rabbit to do? Inspired by Korean folklore, RABBIT MOON offers whimsical illustrations in a gentle story of friendship and responsibility. Ages 3-up. Recommendation by Greg Leitich Smith. SEESAW GIRL by Linda Sue Park, illustrated by Jean and Mou-Sien Tseng (Clarion, 1999). 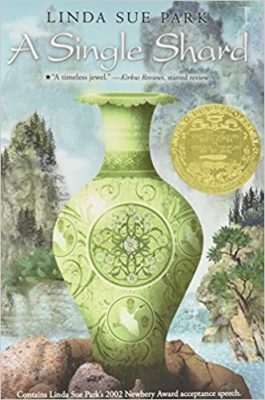 Set in 17th Century Korea, this story of Jade Blossom’s life inside the Inner Court of her family and how her curiosity brings adventures. Ages 8-up. A SINGLE SHARD by Linda Sue Park (Clarion, 2001). Tree Ear, a young orphan, becomes an apprentice to a master potter. Despite many challenges he perseveres in this role, even making an arduous journey to the royal court, and continuing when only a single shard is left to show. Ages 10-up. A STEP FROM HEAVEN by An Na (Front Street, 2001). Young Ju and her family have emigrated from Korea to the United States, where they dream of building a better future. Once here, the family struggles economically – Young Ju’s parents both work long hours at two jobs – and with her father’s increasing drunken violence. The novel takes the reader from Young Ju’s arrival at age four to when she leaves for college; and, without being heavy-handed, offers a genuine sense of what it’s like to learn the language and of Young Ju’s frustration at the family’s necessary frugality. An excellent immigration story. Ages 10-up. 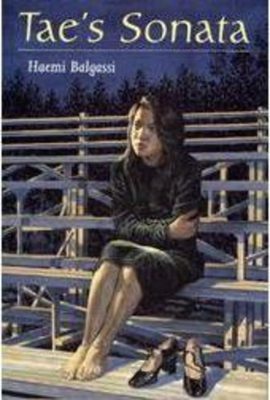 TAE’S SONATA by Haemi Balgassi (Clarion, 1997). Tae has to sort out her feelings when she is assigned to do a school report on South Korea with a popular guy. An interracial romance and a sweet look at Korean-American family life that also deals with what it’s like to feel spotlighted for your race. Ages 10-up. See also An Interview with Haemi Balgassi. WAIT FOR ME by An Na (Putnam, 2006). For Mina, it’s Harvard or nothing–at least that’s what Uhmma, her mother, demands. Plus, Mina has to work at her family’s dry cleaning business and protect her younger sister, Suna, from Uhmma’s disdain. But Mina’s life is a lie. When Ysrael offers his heart and asks what she wants, what will happen next? Ages 12-up. 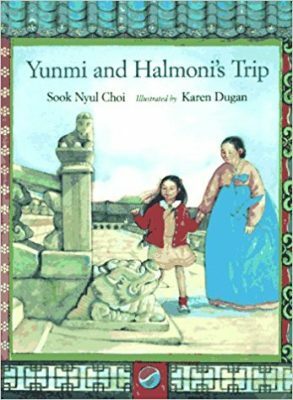 YUNMI AND HALMONI’S TRIP by Sook Nyul Choi, illustrated by Karen Dugan (Houghton Mifflin, 1997). Yunmi accompanies her grandmother to Korea, where her grandmother was born. Korea is exciting, and it’s wonderful for Yunmi to meet her relatives. But it isn’t home to her. What if Halmoni (grandmother) decides to stay? Ages 4-up.